A perfect diamond, with no impurities and no defects, is completely colorless. As the purity of the diamond decreases, the color of the diamond increases. The most common impurity in diamonds is clusters of nitrogen atoms inside the diamond. Over 98% of mined diamonds have nitrogen impurities, which give diamonds undesirable tints of yellow and brown. In order to uniformly grade the color of diamonds, gemological laboratories have standardized on a range of letter grades of D-Z. as explained in the chart below. 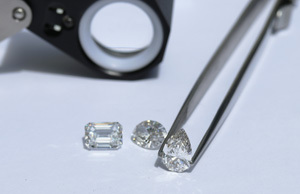 Ada Diamonds is proud to only sell diamonds that are colorless (D-E-F) or near colorless (G-H-I-J). Perfectly colorless diamonds are more desirable and therefore command a premium. While it is extremely rare in nature, other impurities and crystal defects can result in a rainbow of colored diamonds: Red, Purple, Pink, Orange, Yellow, Green, Blue, Gray, and Black. These diamonds are classified as fancy colored diamonds, and less than 0.1% of mined diamonds receive this classification. Ada Diamonds can intentionally introduce trace elements into our diamond growth cells to create high quality colored diamonds.